A choccie cake might not sound like the healthiest late-night treat, but since you make it in a mug, there’s no going back for more. 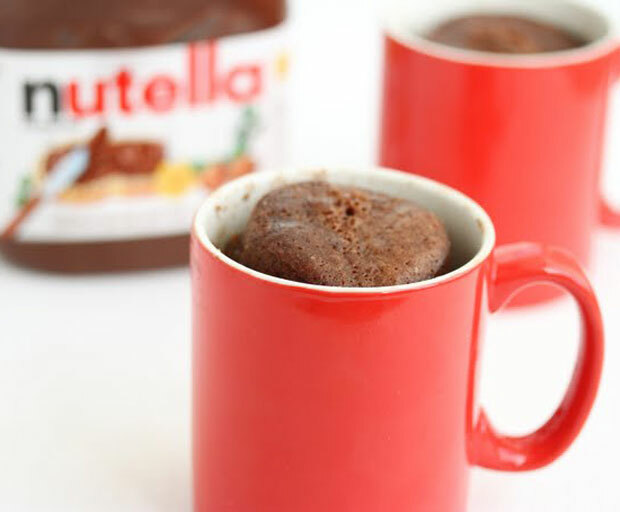 Actually, this Nutella Mug Cake is so rich and yummy, a single serving is all you need to satisfy that sweet craving. Combine all ingredients into an oversized mug. Mix with a small whisk until batter is smooth. Cook in microwave for about 1 minute. Insert a sharp knife into the top of cake and it should come out clean rather than gooey. If cake is not cooked in 1 minute, add an additional 20 seconds. 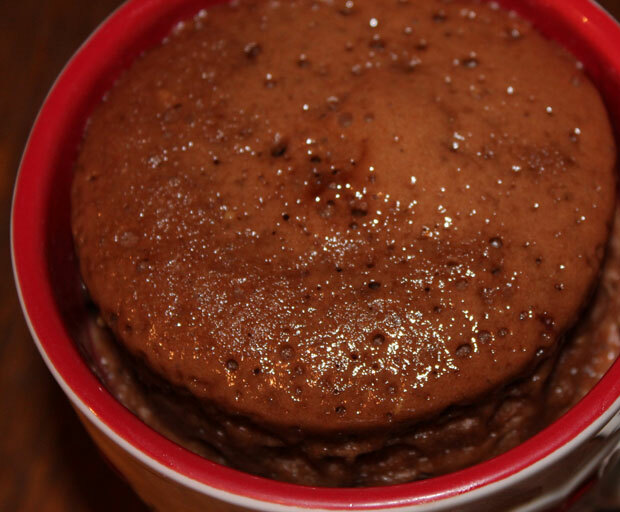 Let cake cool in mug completely before eating. 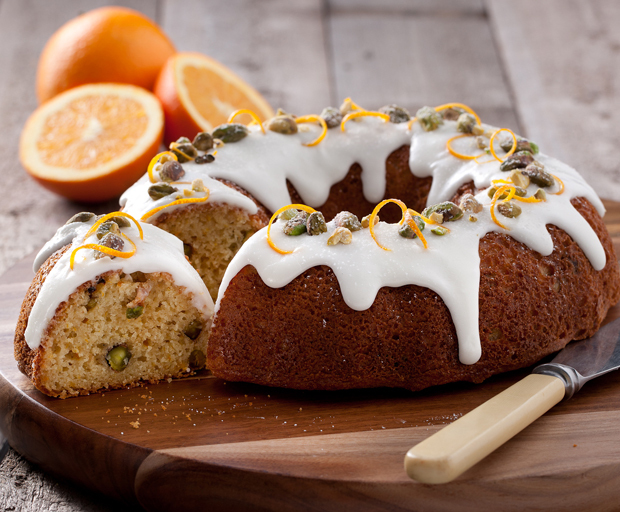 This lovely light yoghurt cake is flavoured with pistachios and oranges and drizzled with a delicious yoghurt icing, the perfect weekend baking project to serve for afternoon tea. 2. In a large mixing bowl, add pistachios, self raising flour, semolina, bicarbonate soda and sugar, mix well to combine. 3. In a separate bowl whisk together the five:am natural organic yoghurt, eggs and oil. 4. Add orange juice and zest to egg mixture. 5. Whilst stirring the flour mixture, slowly add yoghurt mixture until well combined. Rest for 5 minutes. 6. Spoon mixture into a greased 24cm cake tin. Bake in oven for 50-60 minutes or until cooked. 7. Allow cake to rest in the tin for 5 minutes before turning out onto a wire rack to cool. 8. When cool, drizzle yoghurt icing over cake and decorate with pistachio nuts. 1. Mix icing sugar and five:am Vanilla Bean organic yoghurt together until well combined. 2. Allow to thicken in the refrigerator for 30 to 60 minutes before spreading on cake. Tip: Keep the frosted cake out of sunlight or heat, as this frosting easily melts. 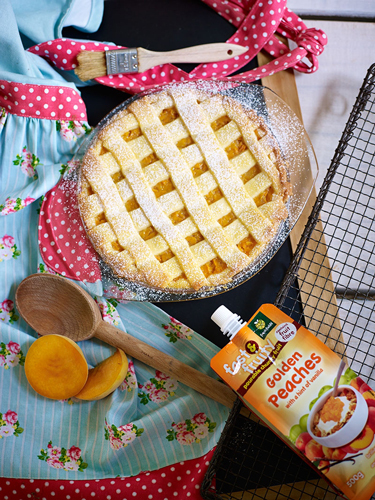 Who wouldn’t love a slice of this luscious-looking peach pie? 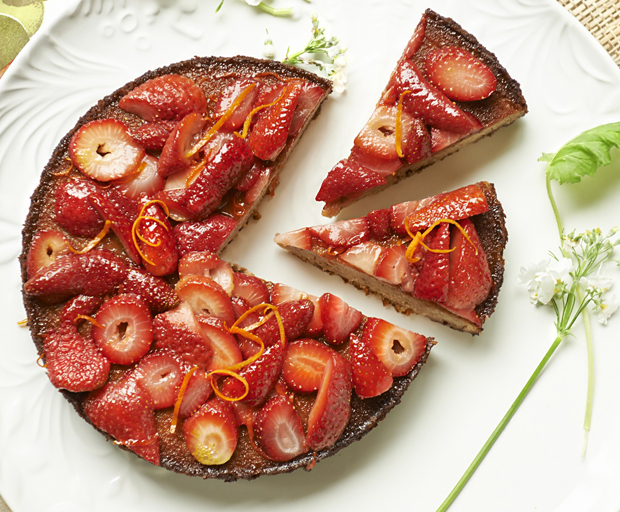 It’s so easy to make too – bake it this weekend! 1. Preheat oven to 180C. Line the bottom of a 23cm pie dish with pastry; trim even with edge. 2. In a small saucepan, combine the cornstarch, gradually stir in juice. Bring to a boil; cook and stir for 2 minutes or until thickened. Remove from the heat; stir in lemon juice and butter. Gently blend into peaches. Pour peach mix onto crust. 3. Roll out remaining pastry; make a lattice crust. Trim, seal edges. Fast & Fruity are great tasting, pourable, 100% pure chunky fruit, with absolutely no added sugar. They are perfect as a quick and easy breakfast topping or ingredient for anything from smoothies and baking to ice blocks and pancakes. 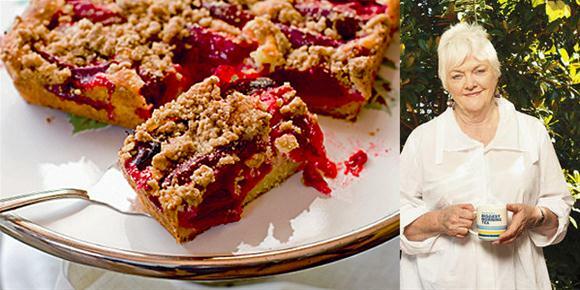 There’s still time to host an event for Australia’s Biggest Morning Tea, and we think this easy plum cake by celebrity chef Stephanie Alexander would make a delicious addition to any morning or afternoon tea! 1. Preheat oven to 180?C. Grease an 18 cm-square cake tin and line base with baking paper, leaving some overhanging to help ease cake out (it can’t be inverted onto a cake cooling rack). Otherwise, grease a 20cm springform cake tin. 2. To make the streusel mixture, mix sugar, baking powder, cinnamon and flour in a bowl. Rub in butter so mixture is a bit crumbly and lumpy. Set aside. 3. Sift flour, cream of tartar, bicarbonate of soda and salt into a bowl. Whisk egg with 2 tablespoons of the buttermilk or milk. Cream butter and sugar until pale and thick in a food processor. Tip in flour mixture and pulse to mix quickly. Add egg/buttermilk mixture and process just until you have a smooth batter; it should be a dropping consistency. If it is quite stiff, mix in remaining buttermilk (this will depend on size of egg used). 4. Scrape butter into prepared tin and smooth the top. Press plum into batter in rows or circles. Scatter over streusel mixture. Bake for 35-40 minutes or until a skewer inserted in the edges comes out clean (it will still test soft in the middle where plum juice has oozed into cake batter). Cool cake in tin on a cake cooling rack until just warm. Lift cake out using overhanging baking paper to assist, then transfer to a plate. Carefully lift base of cake with wide spatula and ease paper out. Dust cake with icing sugar, if desired, and serve with double cream. Recipe from Stephanie Alexander’s Kitchen Garden Companion, Lantern, RRP $125.